The Paying Artists Working Group met last month to decide on a work plan for implementing and developing a-n’s Exhibition Payment Guide over the next four years. The group, which includes the artist Rachel Maclean and representatives from AD:UK, Crafts Council, CVAN, Engage, Museums Association, Plus Tate, Scottish Contemporary Art Network (SCAN) and Visual Artists Ireland, will deliver appendices to clarify and augment the existing guide, with a full second edition scheduled for 2022. The Exhibition Payment Guide was published in 2016 following the Paying Artists’ campaign’s two-year sector-wide consultation, and sets out best practice for establishing and agreeing exhibition payments for artists. For use by artists and organisations, it is endorsed by Arts Council England, Creative Scotland and Arts Council of Wales. Exhibition Payment is a payment to artists that values their singular imagination and professional contribution to the success of publicly-funded exhibitions. As artists’ overheads continue to increase while funding streams diminish, it is essential to establish Exhibition Payment across the sector. It is a valuable income stream for artists and it should be one that they can rely on. Organisations are also feeling the pinch too but there is hope that the new museums and galleries tax relief, which can be back-dated to April 2017, will support the process of making Exhibition Payment for those organisations registered as charities. By contributing to artists’ livelihoods, Exhibition Payment will help the resilience and diversity of the sector as a whole and ensure that in years to come we will still be able to access quality art that reflects the broadest possible spectrum of human experience. Working with partners DHA, in 2018 a-n and the Paying Artists Working Group will focus on developing guidance around commissioning, socially engaged practice and collaborations. Subsequent years will examine works on loan from public or private collections and – post-Brexit – touring exhibitions and international touring for artists and commissioners. A set of case studies to be published this spring will showcase existing good practice by sharing how organisations are working with and paying artists. From artist-led projects to national institutions, these will cover the full range of framework categories in the Exhibition Payment Guide. Later in the year we will produce new case studies exploring how the guidance can best be applied to contexts such as live art, sound art and performance art. We’ll also start collecting essential data through the first sector-wide survey on Exhibition Payments in April, which will be repeated in 2020. There is currently no baseline data for Exhibition Payment, so the continued support and input from both artists and organisations is critical for a robust analysis of current practices and the informed development of the Exhibition Payment Framework. There are also plans for information and training events to aid implementation, including sessions for artists at a-n’s upcoming Assembly events. We’ll also be working with higher education to arm students with essential information as they embark on their careers as artists and curators, as well as developing practical resources to support artists and build their confidence in approaching Exhibition Payment. 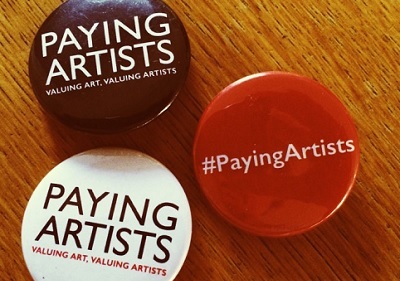 In addition, we’ll continue to lobby policy groups and cultural decision-makers, and liaise with arts councils, funders and policy makers to support and embed the Exhibition Payment guidance in the working practices of funded organisations.